Raw sewage can have dangerous and deadly effects on anyone exposed to the infectious waste. SI Restoration, a leading authority on sewage damage remediation for over twenty years, has released an infographic highlighting the hazardous effects of raw sewage. 'Effects of Raw Sewage' is designed to inform victims of sewage and flood damage about the deadly health hazards that lurk in raw sewage. With various locations in the Mid-Atlantic United States, SI Restoration has been a leading expert in the sewage and flood damage industry since 1989. 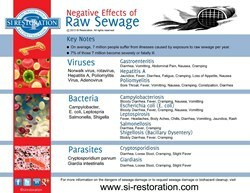 Project managers have gathered countless amounts of data and experience to deliver the company’s recent publication, “Effects of Raw Sewage.” This highly detailed infographic is designed to inform victims of sewage and flood damage about the deadly health hazards that lurk in raw sewage. Raw sewage can affect any residential or commercial property for a number of reasons. Natural disasters, severe storms, and flooding are most common. However, deterioration and clogging of sewer mains, bursting pipes, and sewage plant overflow can also cause homes and businesses to be exposed to the deadly diseases living within the dirt and filth. Each type of pathogen is broken down into unique categories with each section providing a list of illnesses they cause. Symptoms are provided in order to inform property owners how to detect the infection before it graduates to an uncontrollable level. Some infections can become blood borne, causing fatalities in those who are exposed to the raw sewage. According to SI Restoration, sewer water damage must be addressed immediately to avoid outbreaks of disease and ruination of property. Standing water can saturate building materials such as carpeting, padding, tile, wood, drywall, plaster, and insulation causing a compromise in the building’s integrity. It is suggested that any building materials, furniture, upholstery, electronics, or other household items be safely removed from the premises if they have been affected by sewer water. Only highly-trained, certified technicians should handle raw sewage extraction. Water damage is also known to cause a need for mold remediation. Mold can grow just 48 hours after porous, organic materials are exposed to water. Mold infestation can breed a brand new health risk. Mold sickness, on top of illness caused by raw sewage, can be detrimental to a person’s health. For more than 22 years, SI Restoration has provided water damage, fire restoration, mold remediation/removal, hoarding cleanup, flood restoration repair, smoke damage and other restoration services. The company services commercial, industrial and residential customers with an IICRC certified staff. To learn more about SI Restoration, please visit si-resotration.com.